Our Neighborhood Conservation Action Program (NCAP), offered through our partnership with Eversource, is an electricity use audit that saves you money and conserves energy. In addition to serving eligible residents of Boston, Brookline and Newton, we serve the Mystic Valley cities and towns of Malden, Medford, Everett, Melrose, Winchester, Woburn and Stoneham. If you’re an Eversource electricity client and an ABCD Fuel Assistance client, you’re eligible for this program. ABCD follows federal guidelines based on your annual income and how many people are in your family. Your gross family income must be at or below 60% of the Massachusetts median income. In partnership with NSTAR and its Conservation Action Program (NCAP), we perform an energy conservation audit that looks at your major electrical appliance usage in order to help you lower your electric bill. 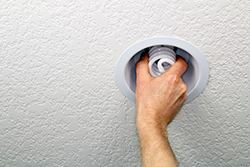 We’ll then give you ideas on how to reduce electricity usage, then help you come up with a savings plan. You’ll also receive energy efficient light bulbs, water conservation materials and possibly a new refrigerator, air conditioner, dehumidifier or front loading washing machine if your existing appliances are inefficient.